I shot this video late one night with my friend Jerry Stefani in 1988. We drove down the Las Vegas Strip and Fremont Street to capture the amazing neon-lit motels that once were ubiquitous but now have mostly vanished. The video was shot while playing a cassette of Chris Isaak’s “Blue Hotel” on my car stereo and edited in-camera to the music. I’ve been fascinated by America’s mom and pop motels since I was a kid, associating them with family vacations and adventure. I especially like themed motels, and Las Vegas was full of them. Not surprisingly, many were gambling or desert themed. In the last few years, Jerry Stefani has researched the histories of the Vegas motels featured in our video as well as dozens of others on Las Vegas Boulevard and Fremont Street. He created a terrific website with Then & Now photos that documents his discoveries. I hope you enjoy our 3-minute music video from the days before Steve Wynn destroyed everything we loved. Gallery | This entry was posted in Home and tagged Chris Isaak, Fremont Street, Las Vegas, Las Vegas Nevada, Las Vegas Strip, Motels, Music video, neon, nightlife, Old Vegas, vintage. Bookmark the permalink. 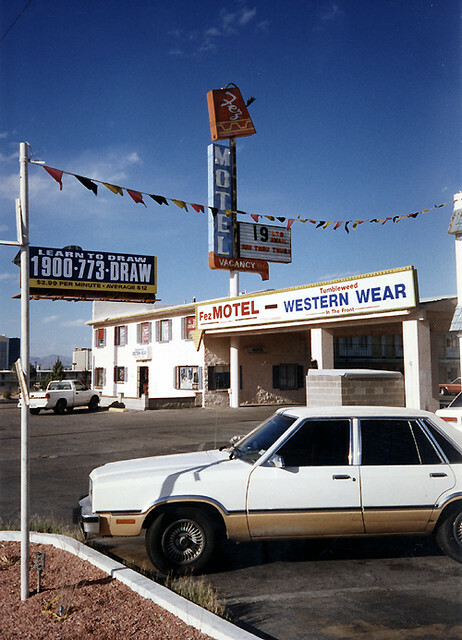 The Chris Issack tune (Blue Hotel) was a great accompany to the video…..when we first came to Vegas in the mid 70’s we first stayed at a cheap motel right next to the old (Whimpy’s) on LVBLV….then we stayed on Boulder Hwy at two motels, the (Gateway) and the one next to it…..then we moved on down to Fremont Street, and stayed at the (Ferguson Motel) and I was just 15 years old, and when not watching old movies in the air-condition cheap rooms, I would hang out by the pools of these motels….and met some interesting characters, sat and drank beer with them and learned of their stories too…….and as a Air Force Brat kid, we in the past moved every 3 or 4 years, and while on the road, stayed in many of Blue Hotels…….take care, loved the video…….Ron Hunter. I couldn’t find much. It’s not from the late 50’s, early 60’s era. Here is an image. Says it closed in 2000. The address I found was 4213 S Las Vegas Blvd. That would have put it south of Tropicana and across from Mandalay Bay/Luxor. It wasn’t in Las Vegas Mikey’s list either. Alas, I did not see the Fez Motel, or the Glass Pool Motel, or La Concha. Or the Tam O’Shanter…if I’m remembering these names correctly. Neon is incomparably wonderful stuff. But as those of us who are old enough will remember – and as this video shows – neon was/is delicate and temperamental. Consisting of thin glass tubing, it could be broken easily. More frequently, its electrical connections gradually wore out, causing tubing to flicker, darken, or die completely. Devices that controlled blinking ceased functioning. Every city and town had sign companies that not only fabricated new neon signs, but constantly worked to keep old ones running. Most of these companies are gone now, as are most of the signs themselves. And we are poorer for this lack. I don’t remember why we didn’t include the Glass Pool Inn, which would have been terrific if the pool was lit, but the La Concha and Tam O’Shanter were a bit too big, well kept, and showy for the mood we were trying to create with the video. I’ve loved neon signs since I was a kid and have photographed them while on family trips to the mainland since the 1970s. I’ve also been collecting motel postcards since 1981 (and have amassed a collection of over 2000). The death of the American mom-and-pop motel has caused me great grief over the years; I still search for their remnants when traveling through small towns.